Can Riots Be Predicted? Experts Watch Food Prices : The Salt High food prices have often been cited as a factor behind mass protest movements. But a group of researchers say food prices can actually be used to predict when social unrest will occur. And according to their mathematical modeling, we've hit the threshold for more waves of riots. When French peasants stormed the Bastille on July 14, 1789, they weren't just revolting against the monarchy's policies. They were also hungry. 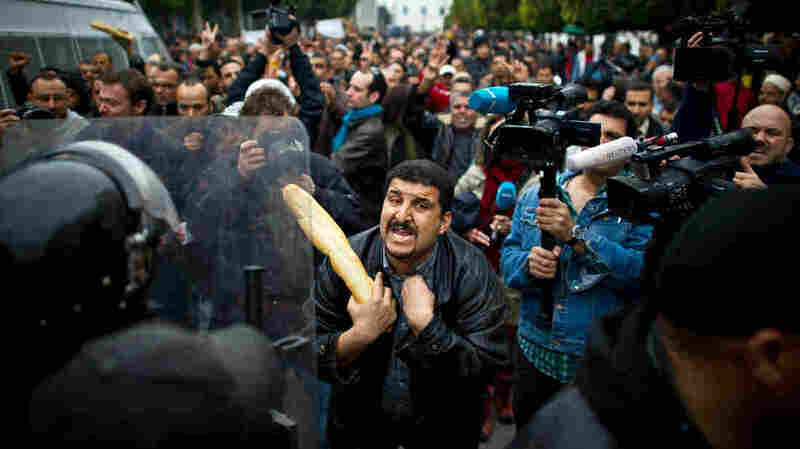 From the French Revolution to the Arab Spring, high food prices have been cited as a factor behind mass protest movements. But can food prices actually help predict when social unrest is likely to break out? Yes, say a group of researchers who use mathematical modeling to describe how food prices behave. Earlier this summer, their model had predicted that the U.S. drought would push corn and wheat prices high enough to spark social unrest in other parts of the world. "Now, of course, we do see this happening," says Yaneer Bar-Yam of the New England Complex Systems Institute in Cambridge, Mass. And unless those food prices come down, the researchers warned last week, more waves of riots are coming. Obviously, there are complex social reasons why people riot. The current protests in the Mideast were set off by outrage over a crude anti-Islam film. Years of government oppression and economic instability led to the Arab Spring uprising. But it's high food prices, Bar-Yam and his colleagues argue, that create "the range of conditions in which the tiniest spark can lead to riots." Over the past year, the institute has gotten a lot of attention for its accurate predictions of food price behaviors. Last fall, the researchers released a study that showed big spikes in food prices coincided with food riots in 2007-2008 and 2011, including the events of the Arab Spring. But their model also offers the potential to forecast future social unrest by identifying "a very well-defined threshold [for food prices] above which food riots break out," Bar-Yam tells The Salt. In fact, Bar-Yam and his colleagues say they submitted their analysis warning of the risks of social unrest to the U.S. government on Dec. 13, 2010. Four days later, Tunisian fruit and vegetable vendor Mohamed Bouazizi set himself on fire – an event widely seen as the catalyst for the Arab Spring. The researchers define the riot danger zone in relation to the U.N.'s FAO Food Price Index, which tracks the monthly change in international prices for a basket of cereals, dairy, meat, sugars and oil/fats. Riots become more likely, their model showed, when the index goes above 210. The index has been hovering above that "disruption threshold" since July, pushed upward by the drought in the U.S., the world's biggest exporter of corn and wheat. "What happened was that food prices went up exactly as predicted," Bar-Yam says. Wheat is now at $9 per bushel — higher than the high of $8.94 hit in February 2011, when the Arab Spring was in full swing. Corn is at $7.56 a bushel, close to the $7.65 highs of 2007-2008 — though it spiked well above $8 a bushel this summer. The Mideast is particularly sensitive to wheat prices; it imports most of its wheat, which is a major staple for the region. While the drought is causing the current spike in food prices, prices have also been on a steady, long-term trajectory upward. So what's behind that trend? NECSI's model has fingered two key suspects: speculation and the conversion of corn to ethanol. (More on that later here.) Even without the drought, Bar-Yam says, food prices were headed toward the riot zone by early next year. The institute's work isn't without critics. Blogging at G-Feed, economist Dave Lobell notes that NECSI's papers aren't peer-reviewed — they are simply released publicly. "But in the case of NECSI, I think they have come up with a pretty satisfying solution — making testable predictions about the next year," Lobell writes. And NECSI's research has a prominent fan in Peter Timmer, a professor emeritus at Harvard University and one of the world's leading agricultural economists. The institute consulted Timmer on some of its earlier work, and he joined its faculty this summer.